Self watering planters take the stress out of caring for your plants. 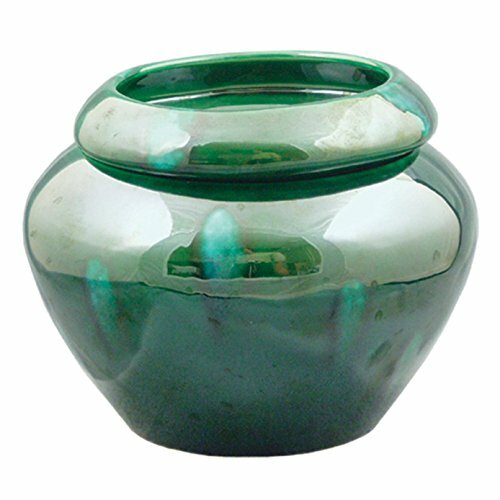 The green urn shaped self watering planter consists of a 6" wide green outer pot that acts as a reservoir, storing one to three weeks worth of water for the plant, and a porous inner pot with a 4" wide opening that allows water to seep into the soil as the plant requires moisture. Now you can go on vacation or leave the office for a week without worrying if your plants will be alive when you return! These self-watering planters are great for any moisture-loving plant, including, but not limited to, African Violets, Asparagus Fern, Boston Fern, Christmas Cactus, Chrysanthemum, Grape Ivy, Swedish Ivy, Peace Lily, Philodendron, Poinsettia, and Spider Plant. Directions and a list of appropriate plants are included. Made in Thailand. Plant not included. Outer pot is fully glazed inside and out to protect furniture from leakage and sweating. If you have any questions about this product by TVP Pottery, contact us by completing and submitting the form below. If you are looking for a specif part number, please include it with your message.